Scones are one of my family’s favorite breakfast foods. They’re easy to make, and come in a lot of different flavors. They can also make a great snack any time of the day. Scones are so easy to make – all you need to do is follow the simple directions and bake. If you don’t have almond milk, any milk or buttermilk will work (though it will change the nutritional info) and you can use either unsweetened applesauce, Greek yogurt, mashed fruit or even baby food as well. I prefer applesauce as it adds sweetness, so we don’t have to add as much sugar, pick up the little cups of applesauce, they are just about 1/2 a cup and makes for easy baking anytime. 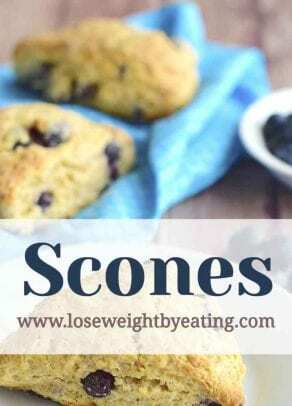 Below is a basic scone recipe that is great for quick and easy scones. Here is my basic recipe for scones. See below for ideas for adding fruit and other flavors. Whisk flour, sugar, baking powder and baking soda together in a large bowl or your big standing mixer. Cut up the butter in small pieces and then add to the flour mix and work with your fingers until the chunks of butter are small as peas. In a separate bowl combine the applesauce and almond milk. Slowly add to the flour mixture stirring until just combined. Flour a clean surface, split the scone batter in two dough balls on the floured surface. Squish and mold into two round discs, then use a pizza cutter cut each disk into 8 slices, just like you are cutting a pizza or a pie. Arrange on the baking sheet, you can get them close together as they don’t spread too much but make sure they are not touching. Bake for 15-17 minutes, until they are slightly golden. Remove from the oven, let cool on the baking sheet (this helps to keep them cooking) for 5 minutes. In a small bowl combine the powdered sugar and 1 teaspoon water or juice, adding in more as you mix as needed. Once you get to the right consistency stop adding in water or juice. You want it to be just runny. Once the scones are completely cool you can glaze them. Use a fork to drizzle on a little glaze STOP, wait a few minutes and drizzle some more, stop again and repeat. (If you put it all on at once you will end up with a pool of glaze on the parchment paper). Special Tip: To figure out the nutrition for all the recipes below is simple, just use our nutritional calculator to figure out the add ins (chocolate chips, blueberries etc.) use the calculator, then add to the nutritional information in this recipe. This Blueberry Scones recipe is easy and delicious, and because we use dried blueberries, they store well. Make this recipe on a Sunday or after work on a weeknight for fast and delicious “on-the-go” breakfasts, so much fancier (and easier to make) than a blueberry muffin. If you want to use fresh or frozen blueberries they will work too, but you will need to cut the amount down to ⅓ cup, and freeze the blueberries solid before adding to the batter so they don’t fall apart. For storing, wrap each blueberry scone individually in plastic wrap and they will hold together longer… though they may get soggy, and that is why we recommend dried berries here. Whisk flour, sugar, baking powder, baking soda and salt together in a large bowl or your big standing mixer. Cut up the butter in small pieces and then add to the flour mix and work with your fingers until they are small as peas. Mix in the Greek yogurt until just combined, then add in blueberries and gently fold together. Flour a clean surface, split the scone batter in two dough balls on the floured surface. Squish and mold into two round discs, using a pizza cutter cut each disk into 8 slices, just like you are cutting a pizza or a pie. In a small bowl combine the powdered sugar and 1 teaspoon water, adding in more as you mix as needed. Once you get to the right consistency stop adding in water or juice. You want it to be just runny. If you’re like me, you stockpile pumpkin puree so you have it year around. For those of you who do not, you can purchase pumpkin puree year round online (check here) and make this Pumpkin Scones recipe whenever you like. Otherwise, this pumpkin scones go great on Thanksgiving or Christmas morning and make your home smell like fall. So stock up when you can, a happy pantry has many cans of pumpkin puree. Whisk flour, sugar, baking powder, baking soda and pumpkin pie spice together in a large bowl or your big standing mixer. Cut up the butter in small pieces and then add to the flour mix and work with your fingers until they are small as peas. In a separate bowl combine the pumpkin puree and almond milk. Slowly add to the flour mixture stirring until just combined. Squish and mold into two round discs, then use a pizza cutter cut each disk into 8 slices, just like you are cutting a pizza or a pie. In a small bowl combine the glaze ingredients and mix together until there are no lumps, drizzle over the scones, or gently dip the tops of the scones into the glaze allowing extra to run off into the bowl. Let set for 10-20 minutes… if you can stand to wait, they are also yummy hot, yummy and messy. If you like, swap out ½ of the semi-sweet chips for white chocolate, or if a topping is a must in your book, then hold ½ of the chocolate back, melt and drizzle over cooled scones. In a medium bowl combine the Greek yogurt, almond milk and vanilla extract. Mix the Greek yogurt mixture and chocolate chips into the flower until just combined. Few things go better together in sweets than cranberries and oranges, and this Cranberry Orange Scones recipe is so good you’ll crave them often. Luckily we’ve shaved off 100’s of calories, swapped out ½ the butter and over ½ the sugar for applesauce and used ingredients like orange zest to boost flavor without adding any calories. 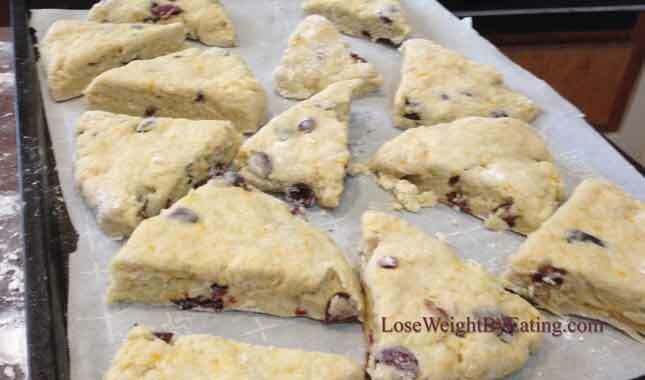 If you find yourself making these cranberry orange scones often, check out my Cranberry Orange Breakfast Cookies in my best selling cookbook WeightLossTopSecret. Whisk flour, sugar, baking powder, baking soda and orange zest together in a large bowl or your big standing mixer. Cut up the butter in small pieces and then add to the flour mix and work with your fingers until they are small as peas. In a separate bowl combine the applesauce and almond milk. Slowly add to the flour mixture stirring until just combined, add in the cranberries and fold in. Squish and mold into two round discs, using a pizza cutter, cut each disk into 8 slices, just like you are cutting a pizza or a pie. In a small bowl combine the powdered sugar and 1 teaspoon of orange juice, adding in more as you mix as needed. Once you get to the right consistency stop adding in juice. You want it to be just runny. If you like this orange cranberry scones recipe, you might also enjoy my Peach Cranberry Scones with White Chocolate, also. I love going to fancy tea places with my little girl, we get scones with clotted cream and my favorite, lemon curd… YUM! Well, I wanted to recreate this delicious flavor, without all the calories and work of lemon curd, and I think you will fall in love with this easy Lemon Scones recipe. You can add in ½ cup dried cranberries, blueberries, or strawberries if you like a chunkier scone, but alone with a cup of tea these lemon scones are perfect. Whisk flour, sugar, baking powder, baking soda, lemon zest and salt together in a large bowl or your big standing mixer. Cut up the butter in small pieces and then add to the flour mix and work with your fingers until they are small as peas. Mix in the Greek yogurt and almond milk until just combined. In a small bowl combine the powdered sugar and 1 teaspoon of lemon juice, adding in more as you mix as needed. Once you get to the right consistency stop adding in juice. You want it to be just runny. Zest remaining lemon over the glazed scones and allow to set before serving. If you like these Lemon Scones, you might also enjoy my addictive Lemon Blueberry Scones recipe. Is there anything prettier than a raspberry oozing over baked goods? The color is simply stunning, and the berry is actually great for your heart and metabolism, so why not go with it?! Because the berry will run, this Raspberry Scones recipe has less milk than the other scone recipes here, so should you choose to go with dried raspberries simply increase the milk to ½ cup and bake on. Whisk flour, sugar, baking powder and baking soda together in a large bowl or your big standing mixer. 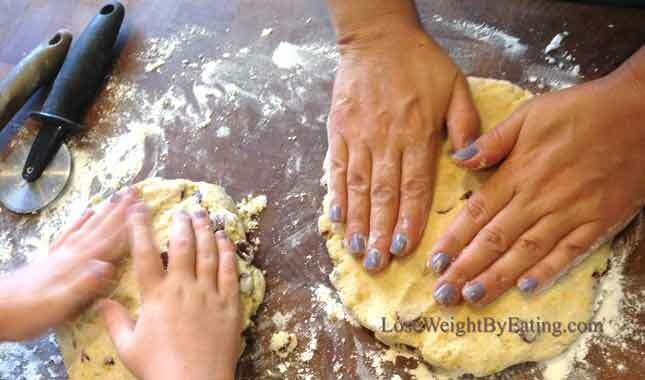 Cut up the butter in small pieces and then add to the flour mix and work with your fingers until they are small as peas. In a separate bowl combine the applesauce, almond milk and vanilla extract. Slowly add to the flour mixture stirring until just combined, fold in the raspberries gently so they all don’t break apart (using frozen raspberries will help hold together). 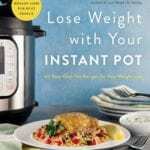 In a small bowl combine the powdered sugar and 1 teaspoon of water or lemon juice, adding in more as you mix as needed. Once you get to the right consistency stop adding in liquid. You want it to be just runny. Are you ready for your house to smell amazing? Because this Cinnamon Scones recipe will do just that! Great for tea parties, brunch or just to welcome a new neighbor to the block, they are easy and fast and can be whipped up fast, chances are you have all the ingredients in you home already. Whisk flour, sugar, baking powder, baking soda and cinnamon together in a large bowl or your big standing mixer. Cut up the butter in small pieces and then add to the flour mix and work with your fingers until they are small as peas. In a small bowl combine the Cinnamon Sugar topping ingredients. Squish and mold into two round discs, sprinkle the cinnamon sugar topping over both discs, then use a pizza cutter cut each disk into 8 slices, just like you are cutting a pizza or a pie. Arrange on the baking sheet, you can get them close together as they don’t spread too much but make sure they are not touching. Bake for 15-17 minutes, until they are slightly golden. 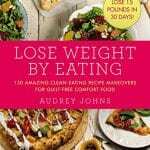 This beautiful Strawberry Scones recipe is from my best selling cookbook WeightLossTopSecret. They are great as just strawberry scones, but I find the burst of lime flavor adds so much complexity and as a bonus, no calories! Try it either way, or try both with and without the lime zest… be sure to comment below and tell me which you prefer. Whisk flour, sugar, baking powder, baking soda and lime zest (optional) together in a large bowl or your big standing mixer. Cut up the butter in small pieces and then add to the flour mix and work with your fingers until they are small as peas. In a separate bowl combine the applesauce and almond milk. Slowly add half to the flour mixture, mix then add the remaining half and the strawberries. Mix until just combined. In a small bowl combine the powdered sugar and 1 teaspoon of lime juice or water, adding in more as you mix as needed. Once you get to the right consistency stop adding in juice. You want it to be just runny. If you’re looking for a savory scones recipe, this Jalapeno Cheddar Scones recipe is the best scone recipe I have ever made. 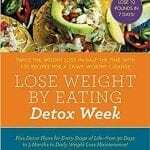 I made it for eHow, the largest how-to site on the internet. Watch the video for the full recipe instructions. There are many ways to make scones, I recommend you try some of these recipes and decide which ones are your favorites. Feel free to experiment with herbs and other spices, they can be made almost any way you can imagine. Happy Cooking…. or shall I say happy baking, and tea partying (pinkies up).